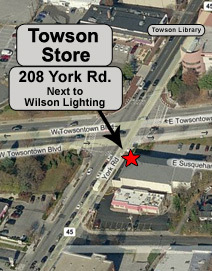 208 York Rd.- Intersection of Towsontown Blvd and York Rd. Take York Rd. north from Towson University. We are on your right next to KFC and Wilson Lighting. For Parking: Turn right onto Towsontown Blvd and then in about 500 ft, turn right onto Virginia Ave and then make an immediate right onto E. Susquehanna Ave. Continue all the way down (past the historic house) to reach the parking lot. 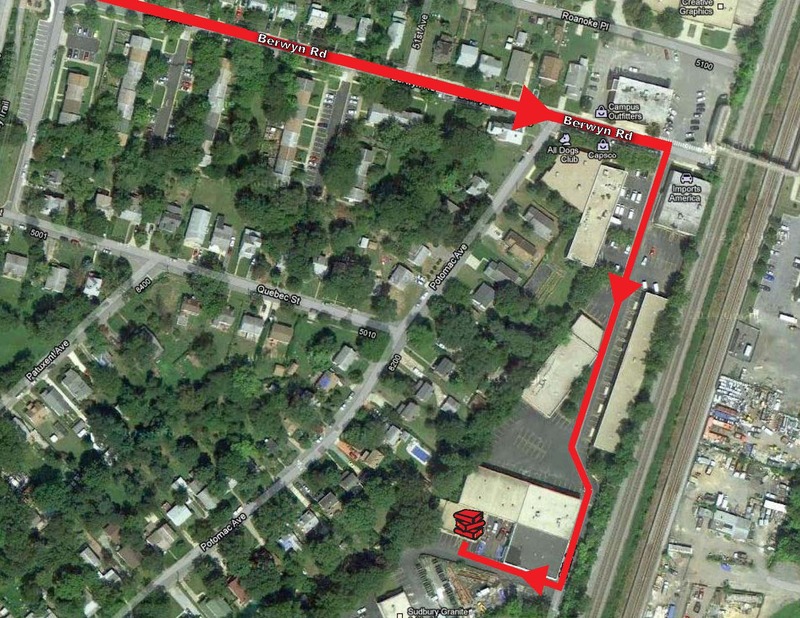 If your driving from outside the Towson area put your address in below and Mapquest, inc. will plot the directions. 125 N Main St.-In the heart of downtown Blacksburg, at the intersection of N Main St. and Jackson St NW. From the main Southgate entrance take US 460 North. Next, take the right exit on to 412 East (Prices Fork Rd.). Finally, make a right on-to N Main St. We're located on the right side, next to Mish Mish. If your driving from outside the Blacksburg area put your address in below and Mapquest, inc. will plot the directions. 720 West Grace St.-at the intersection of W Grace St. and N Laurel St.
From the University Student Commons, go down S. Cathedral Place towards Monroe Park. Take a left onto N. Laurel Street and continue down it until you reach the intersection of N. Laurel Street and W. Grace Street. The BookHolders Store will be across the intersection on your right. 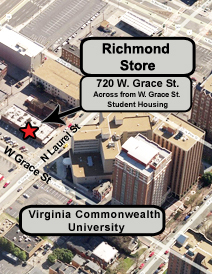 If you're driving from outside the Richmond area put your address in below and Mapquest, inc. will plot the directions. Exit Campus going South on University Avenue. 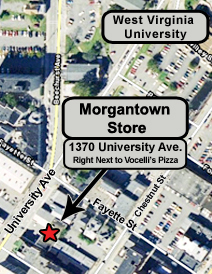 Cross Fayette Street and the BookHolders Store will be on your left. For Additional Parking, continue down University Ave and turn left onto Pleasant Street. Then turn left onto Chestnut Street, cross Wall Street and the lot will be on your left. From the USF main entrance, make a right onto East Fowler Avenue. Proceed to the second traffic light and make a right on Bruce B. Downs Blvd. The store will be immediately on your left. 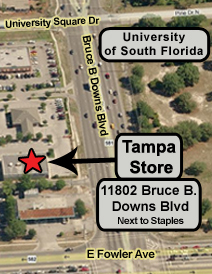 If you're driving from outside the Tampa area put your address in below and Mapquest, inc. will plot the directions.